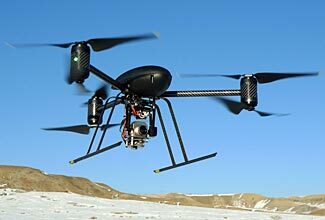 High capability remote-controlled drones can be purchased for civilian use and costing as little as $1000 or less. But be careful how you integrate such capabilities into your retreat’s defensive strategies. I was reading an article on the comprehensive Survivalblog website – an impressive site that should be on your ‘must visit’ list. It has a huge compilation of content, albeit some of it user-contributed and occasionally overlapping and repetitive in nature. This particular article was about using radio controlled planes/helicopters (ie what are commonly now being termed ‘drones’) for reconnaissance and security purposes at one’s retreat. The author of the article was talking about how these sorts of devices (possibly augmented by fixed wireless remote cameras too) provide excellent security and surveillance, and can even send live audio and video feeds direct to his cell phone and tablet, wherever he was. It all sounded wonderful and appealing, and I could understand the author’s enthusiasm for the concepts he was proposing. The other clear benefit to employing drones to keep watch, is that even if the device is spotted, and even engaged and disabled, it’s much better than risking losing a member of your team, or family. Machines are expendable, and replaceable, while people clearly are not. A much better scenario would be to be sitting snuggly in a central command area equipped with CCTV monitors, powered perhaps by a genset, or re-chargeable solar/battery banks. Or even streaming into your laptop, I-phone or I-pad, regardless of your location relevant to the drones area of observation. This is all great stuff, and as a high-tech gadget lover myself, music to my ears. But there are three huge assumptions inherent in his recommendations. The first assumption is not one to be discussed here – and that is the assumption that glorified ‘toys’ can provide an effective and secure observation/security/surveillance system, saving you from needing to have ‘boots on the ground’ out there, in observation posts and walking patrols. That’s an assumption I’m very uncomfortable with; and so much so that it should be the subject of a separate post all on its own. Suffice it to say that any type of security system is best with multiple layers of sensors and sensing, and that there’s still nothing out there that can entirely replace the good old Mark 1 Human Eyeball and Ear. And whereas people and ‘human sensors’ are moderately all-weather capable and can be deployed for some hours at a time, most drones costing less than five or six figures are very limited in their weather handling, their range and their endurance. The other two assumptions are what we wish to discuss in this article. His second assumption – when he says that machines are expendable and replaceable, yes, that is definitely true today. You can order spare parts or complete new machines online or over the phone today and expect them delivered a day or two later. And probably you’d keep at least one spare for such a mission critical capability on-site, too. The third assumption – when he talks about streaming video into a laptop, iPhone or iPad, regardless of location, that too is largely true today, as long as you are within a Wi-Fi or wireless data coverage area. Of course, many of our retreat locations suffer from poor cell phone signals at the best of times, and very few also have good fast data service, but that is a known variable that can be factored in to one’s planning. But – and here’s the huge, enormous, overpowering but. What happens in a Level 2 or 3 situation (defined here)? Even a Level 1 situation will pose problems. What happens when the grid goes down, and society suffers a short, medium, or long-term collapse? How do these assumptions withstand this type of adverse scenario, which is, after all, the scenario we are planning for? You can’t then go online and order things, because the internet will be down. Within a few days, landline phone service will become increasingly fractured too – where will the phone companies get electricity from to power their exchanges, their repeaters, and everything else needed to drive the wired phone system? Sure, you probably understand that if you have traditional ‘POTS’ (Plain Old Telephone Service) at your home/retreat, you don’t need power for a wired phone to work – but that is because the phone company is powering the system at its end. What happens when they lose power? How will you then order a replacement drone? You can’t, can you. All of a sudden, that ‘expendable and replaceable’ item has become precious and irreplaceable. Okay, we’re absolutely not saying you should carelessly hazard the lives of your community members instead (although a cynic might point out that replacement community members might be more readily available than replacement high-tech drones!). We’re simply saying that basing your retreat’s defense strategy on the assumption that your main asset for observation and local intelligence gathering is conveniently available in limitless quantities and can be freely sacrificed is not a good idea. The second of the two paragraphs we quoted above has another enormous assumption built-in to it. While it is true that you could create your own LAN within your retreat, and you could of course use Wi-Fi routers to provide a wireless network that your portable computer devices could connect to, the range and coverage of this network will be limited and much less than the author’s expectations of being available ‘regardless of your location’. Using omni-directional wireless hubs, you can expect a range of little more than 100 ft in the ‘best’ indoor situations, reducing substantially for every wall, floor or ceiling the signal needs to travel through. An outside Wi-Fi antenna can radiate its signal 300 ft or maybe slightly more. These ranges can be massively extended by using special directional antennas on both the Wi-Fi hub and the Wi-Fi device that is connecting to the hub, but an iPhone or iPad has no way of adding an external antenna to boost its range, and while a directional antenna will give you more range in its favored direction, the rest of the 360° of coverage area will have correspondingly less coverage. Furthermore, when your device gets out of Wi-Fi coverage and switches to use the wireless phone company’s data signal instead (3G, 4G, LTE, whatever) that embodies a huge assumption – that the wireless company is still providing service, and that there is an internet connection between the device that receives the drone’s transmissions and the wireless company’s servers. That’s just not going to happen – it only takes one link in the complex chain of dependencies between your drone’s receiver and your phone to go down for the connection as a whole to totally fail. Don’t get us wrong. As we said before, we love technology, and our own retreat is full of high-tech features and capabilities too. But we’ve planned for a future where there are no external resources, and we fully expect our high-tech capabilities to degrade over time, so we have fall-back alternate approaches ready to deploy as this happens. You must not rely upon being able to get resupply of anything. Not food, not fuel, and definitely nothing high-tech. You must not rely upon the continued existence of any external communications of any sort with the outside world – not data, not phone, not even snail-mail. This is part of the differentiation between a Level 2 and a Level 3 event. In a Level 2 event, you can plan to use your stocks and stores of ‘modern day’ conveniences (as long as they don’t require external support from sources and services outside your retreat) in the semi-confident expectation/hope that by the time you have used them all up, life will be back to normal. But the Level 3 event – a longer term one than a Level 2 event, with a slower recovery back to ‘normal’ life – assumes that you are exhausting your accumulated inventories of everything and are having to shift to a type of sustainable life-style that you can support indefinitely, due to an extended time without the benefits of our modern world being restored. Our point is simply this. Examine very carefully the assumptions on which you are basing your planning and preparing. Have you – like the writer of this article – accidentally slipped in some assumptions that the world we experience and enjoy at present will still be there to support you in an uncertain future? If so, adapt your plan to reflect a situation where this external support resource is not available.